Bishop Coulter: The war goes on… Pray for our nation! The war for the soul of this nation continues. The church must not sleep. Many prayed fervently for our nation before the election. We must maintain that fervor. Extreme elements are trying to steal the progress we have made as a nation. Folks, the corruption in high places is rampant. Our new president promises to drain the swamp; but the resistance from the firmly placed establishment is fierce. The only way we will have justice is for God’s people to pray fervently for our nation and speak out against the evil they see. So, let us pray that Congress will see the evil and corruption around them and repent and do something about it. Let’s pray that our congress will put the people’s interest ahead of their own. Without our prayers and God’s help, the administration cannot prevail in its reforms. Let us pray that justice will be done and that this country will once again honor God and the rule of law. 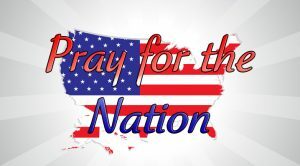 We must not stop praying for our nation. It is the prayers of the saints that will win the day.